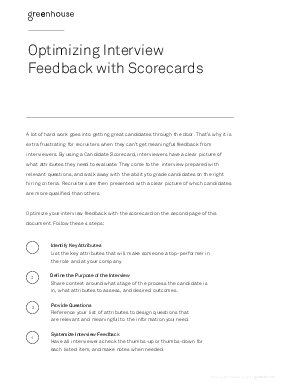 This interactive scorecard will ensure that you get quality feedback from every interview. It will help you convince interviewers to submit feedback because the questions are explicitly linked to specific candidate attributes, which allows you to make evidence-based decisions during your hiring process. Create alignment with hiring managers on what is needed in the role. Prep your interviewers with relevant questions. Collect feedback from interviewers so you can make clear decisions.